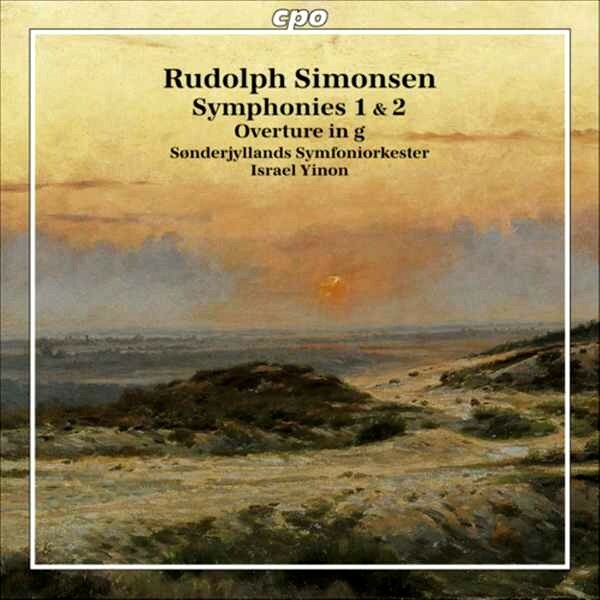 Rudolph Hermann Simonsen (April 30, 1889 - March 28, 1947) was a Danish composer who studied under Otto Malling. In 1928, he won a bronze medal in the art competitions of the Olympic Games for his Symphony No. 2: Hellas. "Simonsen was an important figure on the Danish musical scene and lived until 1947. He was a disciple of Carl Nielsen and took over that composer's position as principal of the Royal Danish Academy of Music in 1931 when Nielsen died. He had been teaching music history and piano since 1915 and had a mission to promote classical music to as many people as possible. He also worked to bring new foreign music to Denmark, and make strong links with Germany, Austria and Hungary." 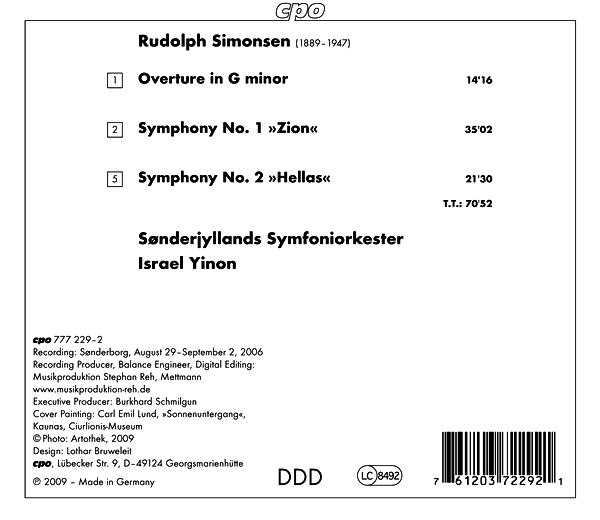 "Coming from a Jewish middle class family in Copenhagen, Simonsen was a prodigy, and not just in music. He had a fluent command of Greek, Latin and Hebrew, and he wrote philosophical treatises on Plato, Spinoza and Goethe. In his later life Simonsen concentrated on music teaching and performance and most of his compositions come from the 1920s, early in his career. He created three symphonies as a grand cycle, based on the cornerstones of classical culture: Jewish, Greek and Roman. (Thus No. 1's "Zion" refers not to The Matrix films but to Jewish culture, and "Hellas" to the Greek.) The themes of Zion concern the wandering of the Jewish people from slavery to the Promised Land, though it is not actually a programmatic work. This was the first time a Danish composer wrote a work directly referring to Jewish culture. The 35-minute work is intense, enthusiastic, and quite original." Symphony No. 2 is shorter and seems more influenced by Nielsen. It uses advanced counterpoint in the service of dramatic expression. Its three movements deal with three ancient Greek subjects: the first Aeschylus' trilogy The Oresteia, the second paints an austere mood on the Acropolis for Loneliness at the Temples, and the last movement is titled The Goddess of Victory Pallas Athena. This symphony sounds even more original, and makes one sorry that Simonsen's works received so little attention during his lifetime. He narrowly missed having his First Symphony premiered by Toscanini, which would have done much for his reputation.